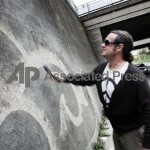 The modern style of graffiti originated in Italy in the form of inscriptions and drawings on sculptures and walls. 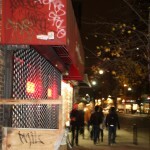 While, many Europeans consider graffiti “urban art” and consider painting on sidewalks and walls just that, Americans tend to call graffiti vandalism. Graffiti as an art form can include drawing, painting and writing, or a combination of all three. 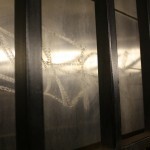 “Tagging” is a type of graffiti used to put a permanent ‘name tag’ on a public surface and has historically been used by some gangs to mark their territory. Many are surprised to learn that modern American graffiti began in Philadelphia in the early sixties and it wasn’t until the later part of the decade that the movement arrived in New York City neighborhoods like Washington Heights, Brooklyn, and the Bronx. Over the course of the next five years, subway cars became so covered in top-to-bottom paintings (“masterpieces”) that windows were complete obstructed. This was the graffiti equivolent of a “golden era,” when graffiti kings would go “all-city” by writing their names in all five boroughs. In 1972 Mayor Lindsay declared New York City’s first “war on graffiti”and in May 1989 the last graffitied train was removed from service. 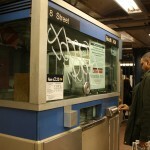 Many large urban centers like NYC have created government funded “anti-graffiti” task forces in addition to initiatives like “Graffiti Free NYC” all in an effort to eliminate gang-related graffiti and tagging. 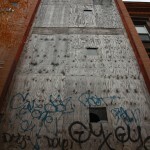 The City’s Graffiti Free NYC Program offers free graffiti removal to properties throughout the five boroughs. 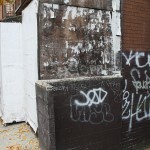 To have graffiti removed from your property, call 311. Today, some artists use acid and various sharp metal instruments to permanently etch their names onto glass and various other surfaces. 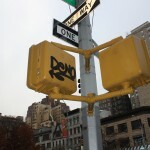 Graffiti, one of the most controversial forms of modern “art,” is rampant in large cities such as New York. While at one point in time graffiti seemed like a strong indicator that the neighborhood was going down hill, now many don’t seem to mind it at all. 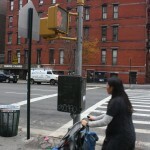 This entry was posted in Photo Slideshows and tagged art, graffiti, New York City, tagging, vandalism. Bookmark the permalink.